Thanks. Acknowledgments. Introduction. PART 1 BACKGROUND TO CLIL What is CLIL? CLIL, content-based language teaching (CBLT) and immersion. Teaching in another language versus teaching through another language. CLIL snapshots. Benefits of CLIL: why is integrating content and a language a good thing? Benefits for learners. Benefits for teachers and schools. The CLIL teacher's role. How 'CLIL' are you? CLIL teachers: new roles. New roles: CLIL subject teachers. New roles: CLIL language teachers. Collaboration between language and subject teachers. Rubric 'Collaboration in CLIL'. Challenges in CLIL. Who is this book for? PART 2 SUBJECT PAGES Introduction. Challenges for CLIL learners. 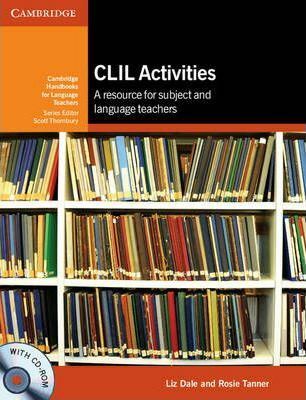 CLIL in subject teaching. How to use the subject pages. Features of the subject pages. Art, design and technology. Economics and business studies. Geography. History. Information and communication technology (ICT). Maths. Music and drama. Physical education (PE). Science. PART 3 PRACTICAL ACTIVITIES 1. ACTIVATING. 1.1 Finish the sentence. 1.2 Graphic organisers for activating (1) Venn diagram. 1.3 Graphic organisers for activating (2) target practice. 1.4 Graphic organisers for activating (3) spider diagram. 1.5 Guessing the lesson. 1.6 Hands-on discovering. 1.7 KWL (know, want, learn) grid. 1.8 Newsy newspapers. 1.9 Placemat. 1.10 Quickest, most, best. 1.11 Red and green circles. 1.12 Researching the lesson. 1.13 Scrambled eggs. 1.14 Vital visuals. 1.15 Word wall. 2. GUIDING UNDERSTANDING. 2.1 Expert groups. 2.2 Gist statements. 2.3 Graffiti. 2.4 Graphic organisers. 2.5 Interactive PowerPoint. 2.6 Interview as input. 2.7 Jumbles. 2.8 Learner-generated questions. 2.9 Listening questions. 2.10 Mind the gap. 2.11 Running commentary. 2.12 Skinny and fat questions and thinking skills. 2.13 Subheadings. 2.14 Understanding new words. 2.15 What was the question? 3. FOCUS ON LANGUAGE. 3.1 Academic word list. 3.2 Bingo. 3.3 Guess the word. 3.4 Hot seat. 3.5 Matching trios. 3.6 Mind maps. 3.7 Mnemonics. 3.8 Noticing. 3.9 Odd one out. 3.10 Personal vocabulary file or glossary. 3.11 Ranking. 3.12 Snake. 3.13 Sorting. 3.14 Taboo. 3.15 Vocabulary posters. 3.16 Vocabulary strategies. 3.17 Word association. 3.18 Word puzzle. 3.19 Word stories. 4. FOCUS ON SPEAKING. 4.1 Balloon debate. 4.2 Describe and draw. 4.3 Eyewitness. 4.4 Information gaps. 4.5 Living gaps. 4.6 Problems, problems. 4.7 Prove it. 4.8 Ranking cards. 4.9 Role play: job interview. 4.10 Rubric jigsaw for presentations. 4.11 Speak for an audience. 4.12 Speaking frames. 4.13 Think, Pair, Share. 4.14 Vivid visuals. 5. FOCUS ON WRITING. 5.1 Advice Column. 5.2 Aliens. 5.3 Brainstorming for writing (1) posters. 5.4 Brainstorming for writing (2) focused free writing. 5.5 Class magazine. 5.6 Framing writing. 5.7 I am a... 5.8 Instructions. 5.9 Lost in conversion. 5.10 Questions to paragraph. 5.11 Recreate a text. 5.12 Real-life writing. 5.13 Storyboard. 5.14 Visuals. 6. ASSESSMENT, REVIEW AND FEEDBACK. 6.1 Assessment questions. 6.2 Complete a rubric. 6.3 Correction code. 6.4 Correction cards. 6.5 First person revision. 6.6 Group self-evaluation. 6.7 Jigsaw rubric: assessing speaking. 6.8 Language feedback. 6.9 Multiple intelligences: exploring. 6.10 Multiple intelligences: assessment. 6.11 Rewrite together. 6.12 Revision circles. 6.13 Stickers. 6.14 Visual assessments. References and further reading. Appendix: The Common European Framework of Reference for Languages. Index.